ANGPT1 is the primary TEK ligand in SC development. (A) Localization of Angpt1 expression in the limbal region. Cryosections from adult Angpt1GFP knockin mice show strong GFP expression in the TM and cells adjacent to the SC outer wall. Endomucin staining outlines the SC endothelium and capillaries of the superficial vascular plexus (SVP). (B) Angpt2 expression in the anterior chamber. Paraffin sections from adult X-gal–stained Angpt2LacZ knock-in mice show X-gal staining in the SC and corneal endothelium, as well as capillaries of the SVP. (C) In comparison with control littermates, eyes from mice with defective angiopoietin signaling failed to develop a normal SC. As previously described, Angpt1 Angpt2 double-knockout (Angpt1;2) mice completely lacked SC. 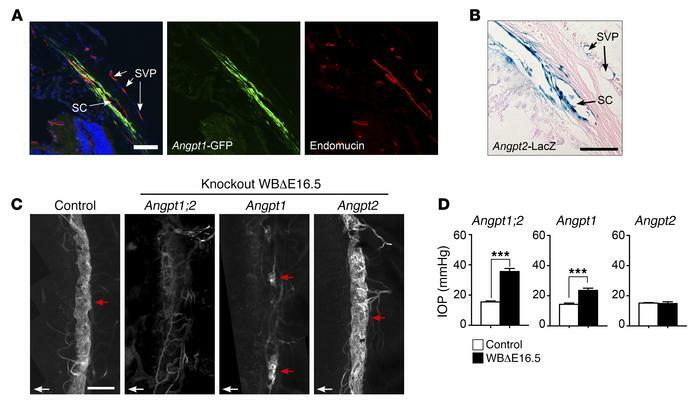 Interestingly, however, while Angpt1WBΔE16.5 mice exhibited a severely hypoplastic canal with only focal development, Angpt2WBΔE16.5 mice had no apparent defect. (D) IOP measurements showed similar results (Angpt1 Angpt2 n = 12, control n = 42; Angpt1 n = 7, control n = 14; Angpt2 n = 3, control n = 4). This highlights the role of ANGPT1 as the major TEK ligand in canal development, though it suggests the possibility of limited compensation. Red arrows in C highlight SC. White arrows indicate the direction of the cornea. Note that faint staining in Angpt1;2 and Angpt1 knockout panels is out of focus light from the ciliary body and limbal vascular plexus. Scale bars: 50 μm (A and B) and 250 μm (C). ***P ≤ 0.001 as determined by Welch’s t test.